Human DNA is assembled into units of chromosomes. There are twenty three pairs in each cell of our body. Individual chromosome is tightly packed in a highly organized manner, located in the cell’s nucleus. The very end of the chromosome called telomere, is heavily guarded by sets of proteins called “shelterin” complex. Otherwise, it can be easily recognized as a DNA break, which triggers DNA damage response, leading to genomic aberrations. As cells undergo cell division, telomeres continue to shorten until the length reaches below a threshold when the cell becomes senescent. Cancer cells, however bypass this shortening due to the activity of telomerase, an enzyme that replenishes the truncated telomere. Research led by Assistant Professor, Sua Myong investigated the molecular mechanism of two shelterin proteins, POT1 (protection of telomere 1) and TPP1, which are known to enhance the telomerase activity. They reported that POT1 binds telomeric DNA in a stepwise manner, thereby unfolding and sequestering the telomeric tail. 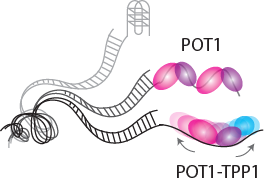 In contrast, the POT1-TPP1 complex showed a rapid sliding motion on telomeric DNA (Structure 2012 Nov 7;20(11):1872-80), which may contribute to facilitating the telomerase activity. This finding was highlighted by the University of Illinois News Bureau (http://news.illinois.edu/news/12/1129telomeres_SuaMyong.html).